This small glass star pendant light has a frosted Mayan pattern on each panel and is framed with aged tin. Creates an elegant lighting accent for Mexican, southwest or Santa Fe decor. 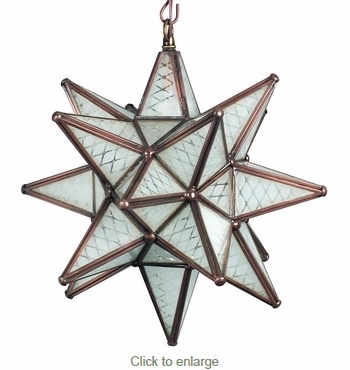 All of our glass star fixtures are authentic creations handmade by artisans in Mexico. Since each star fixture is hand crafted, aged tin finish may vary slightly from what's pictured here. Chain and ceiling plates sold separately. Small Elegant Tin Star Light With Marbles 14" Dia.